When you think of Mexico and booze, you think of tequila, beer and mezcal. But a few weeks ago I attended a tasting at Astor Center and learned about some outstanding mezcal but also about a mezcal based gin and whiskey distilled from ancestral (heirloom) corn. 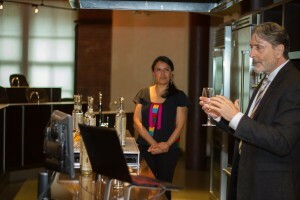 The company conducting the tastings was Pierdre Almas from Oaxaca. The company, the people running it, and their business model are most unusual. 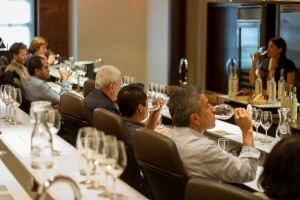 I was invited to the tasting by Yira Vallejo, who I’ve known for many years. Yira’s title, Director of Social Projects, hints at the uniqueness of Pierdre Almas, but it doesn’t really capture her capabilities and expertise. I first met her when she was sales director at Genesis Beverage Brands. Genesis is the wholesale division of MHW, Ltd. and serves as the “incubator” and test marketer for fledgling brands in the NY and NJ markets. While Genesis gets a mixed reaction as to effectiveness, I never met anyone who didn’t think Yira was top of the game and the shining light of the operation. Mezcal isn’t only something you drink: it’s a spiritual drink. It is a spirit and it means culture. Mezcal takes you on a journey where you get to know the families that have been producing it for centuries. It gives people unity and a sense of belonging because it is present in all of life’s events. Tradition isn’t something you get out of a drawer every year, traditions are lived every day. By the way, the name Pierdre Almas, literarily means “one who loses your soul.” It’s the name of a cantina where the cantinero (barman) was known as Pierdre Almas. The cantina was so unusual that Jonathan adopted the name for his company. Yira and Jonathan describe their company (and its mission) as a socially, culturally and environmentally responsible company. That’s not marketing hype, they mean it. The company is committed to the families and villages that produce their mezcal and partner with them to assist in local sports, health and wellness, and education. As to their environmental responsibility, they are actively involved in a wild agave reforestation campaign, among other efforts. From a business standpoint, Pierdre Almas is committed to innovation. It is the first brand to designate the agave species on its label; to bottle mezcal at its original proof; to produce the first gin in the world called Mezcal Gin, gin distilled with 9 botanicals on a base of mezcal. Oh, and let’s not forget about that whiskey. Let’s start with their mezcals. In case you’re wondering about the differences between mezcal and tequila, here is a simple explanation. You’ll also find a 60 second video from Liquor.com here. I tasted two of Pierdre Almas’ offerings. One was a 2015 Espadín from San Luis del Río, Oaxaca. Espadin is the dominant agave in Oaxaca. It grows everywhere, is pest resistant and has a high yield. I found this to be smooth, somewhat sweet, and with a strong floral aroma. The other Mezcal was a 2015 Wild Tepextate, also from Oaxaca. I thought this was more intense but definitely a pleasant sipping mezcal. Their newest innovation is Ancestral Corn Whiskey from Mexico. It is made the old fashioned way in a small copper pot alembic and double distilled. The mash bill includes a selection of red, black, and yellow heirloom corn. There are 60 distinct varieties of corn native to Mexico and more than half of them originated and still thrive in the state of Oaxaca. Many of the varieties date back over 6,000 years. About now you’re thinking—Mexican Moonshine? Well, yes and no. …the Ancestral Corn Whiskey has a remarkably savory cornbread-like aroma and flavor, plus a subtle smokiness reminiscent of mezcal. In other words, it’s unlike most American-made corn whiskies on the market right now. There’s another facet to this story. The state of Oaxaca—known as one of the most biologically diverse ecosystems in the hemisphere—stands on the front-line of resistance against monocropping and the industrialization of corn. 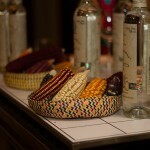 The Ancestral Corn Whiskey project is intended to create an economic stimulus that will drive future cultivation of native corn in Mexico. They also see it as a way to keep GMO corn out of Mexico. Jonathan is also expecting to set some aside for aging but, as you can imagine, it will be some time before that’s available. At roughly $50 for a 375ml, it isn’t cheap. But, then again, worthwhile projects seldom are.